How to get around Bali affordably and reliably isn’t as simple as getting into the designated public buses and head to your destination. Bali, unfortunately, does not have a reliable public transportation scheme at all. Because of the lack of transportation system for the public to access, the locals prefer to go by with their day to day lives using their very own vehicles. And the most popular one in Bali is undoubtedly the scooter. Cheaper than cars, convenient, and slim—the vehicle is perfect for navigating the unbelievably narrow roads in Bali. There are certainly quite a number of tourists having the time of their lives riding them in Bali. But riding a scooter may not be for everyone though. So let’s explore your options on how you can get around in Bali conveniently and safely. 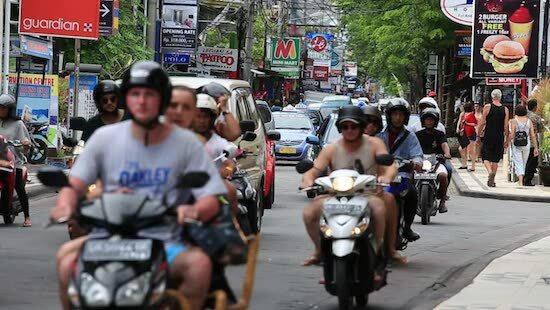 How to get around Bali can be a challenge because of this particular issue. Public transportation in Bali is not at all comprehensive. The arrival of Sarbagita has improved the situation. However, not enough that it can be called a reliable one. And sadly, it is rumored that the Sarbagita bus will be out of service soon. 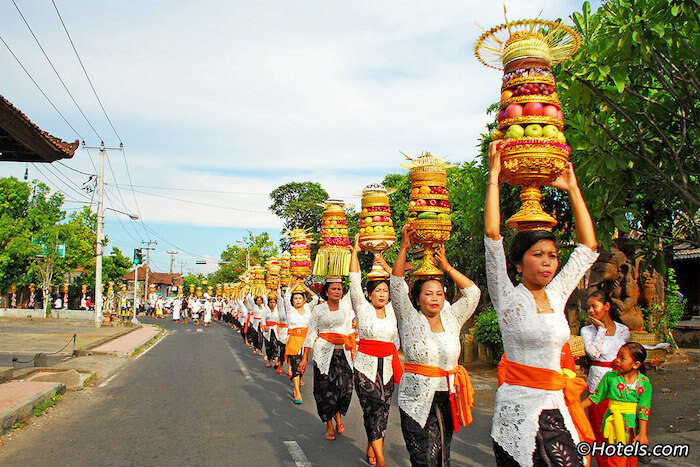 Image: a very common sight in Kuta, Bali. Bali used to have “Bemo”. A small public bus with just the right size to navigate the small roads in Bali. Other regions of Indonesia refer to them as “angkot”. But with more and more public transportation options emerging, the customers of these bemos have lessened considerably. They used to be the cheapest transport option for the locals before the arrival of Sarbagita. Personally, I am glad that the operations of bemo have lessened. The drivers of these minibusses used to be one of the most reckless ones on the road. And because the Balinese don’t have many options in terms of public transportation, they have no choice but to ride them regardless. Glad that those days are long gone! For locals who don’t have personal vehicles or are unable to ride one, the online transport option has been everyone’s favorite for the past years. Ever since its emergence, the online bike and online car hail are only getting more popular. An app you’re likely most familiar with at home, Uber, is not available in Indonesia anymore. Their services in the Southeast Asian market has been bought by Grab. Among Gojek and Grab, Gojek is the more popular one among the two. But their services are identical. 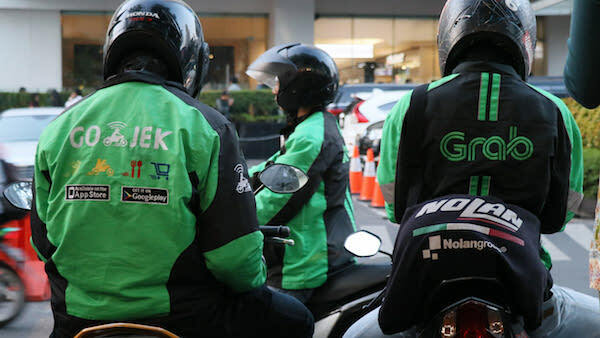 A home-grown option, Go-Jek, has now expanded its business as a cashless payment option that anyone can use. Including you, even if you don’t have an Indonesian bank account. All you have to do is hand cash to your driver, or go to the nearest Alfamart convenience store. And voila, you have your credits! We’ve mentioned in our previous article on airport transfer Bali that Gojek, a home-grown app, is the more popular one and also the (slightly) cheaper one. In Indonesia, there is no question about the competition. 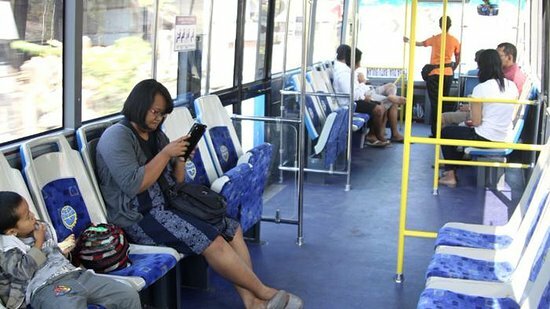 Despite being the most-used transport app in Southeast Asia, Indonesia is sort of an exception. And this is because Indonesians have been exposed to Gojek first. But at the moment, there is very little differences in their transportation services. Whichever you chose, GoJek or Grab, all depends on your preferences. Gojek almost always gives a discount if you pay any of their services using their Go-Pay system. If you plan on going with the online transport app mostly, then topping up your balance is the sensible thing to do in regards to cost-saving. It can be anywhere between 2,000 IDR to 7,000 IDR, or more. The individual discounts may not seem much. But if you use Gojek at least 2 – 3 times a day and stay in Bali for at least a week, it’s 30,000 to 98,000 IDR savings for your transportation cost. Topping up your app balance especially makes sense when you plan to stay in Bali on a longer term. How to has been detailed on the Gojek website. Sarbagita is the only government-owned public transportation in Bali. Sarbagita stands for Denpasar, Badung, Gianyar, Tabanan—four of the regions nearby to each other that the Sarbagita bus serves. Unfortunately, even though the routes But this is mainly also because of the roads infrastructure in Bali is not well-structured. Image: the interior of the Sarbagita bus in Bali. The Sarbagita bus is undoubtedly the cheapest way on how to get around Bali. Tickets for adults only costs 3,000 IDR, and students pay half the price. Despite the super cheap price tag, the Sarbagita bus is kept clean and air-conditioned. These two elements aren’t something guaranteed when it comes to public transportations in Indonesia. I love riding the Sarbagita bus if I’m not in a hurry. The pace is enjoyable especially if you love to chat with your travel mates as one of you won’t have to drive. Riding a Sarbagita is a distinctly authentic and local experience as tourists rarely ever use it. Share space with local vendors with their baskets, students, workers, and just about everyone going with their everyday lives. 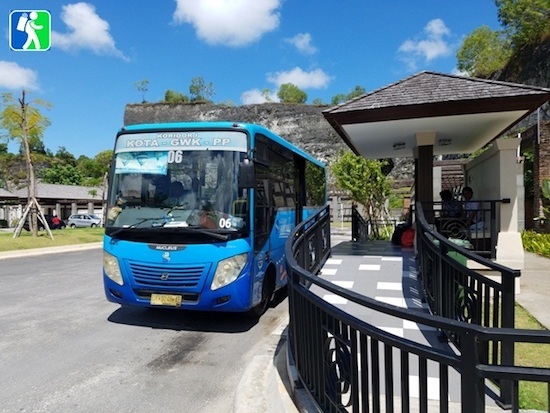 The Kura-Kura Bus is a tourist shuttle bus that can be a pretty reliable option if you want to go to the popular tourist areas or attractions in Bali. The green-colored bus is going to take you on numerous destinations as detailed in their route map. The areas they serve are mainly the South of Bali (Kuta, Legian, Jimbaran, Nusa Dua) as well as some of the Gianyar regency area (Ubud, Singapadu, Sukawati). They have an organized and reliable website where you can also book your tickets. How to get around Bali? Rent a scooter! 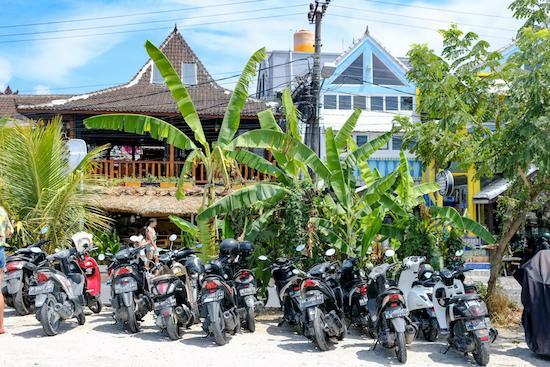 Renting a motorcycle in Bali can get you through so many adventures you have probably won’t go to when you don’t ride the motorcycle yourself. A word of caution: don’t ride a scooter in Bali if you don’t have a license or if you’re not confident in your driving skill. Bali’s traffic and how people drive on the roads are sometimes akin to barbarians. They won’t hesitate to ride their scooter on the sidewalk for pedestrians whenever the traffic is congested. But it is undoubtedly the most convenient way to get to virtually anywhere. Make sure to respect the laws and the local customs if you decide on this option! 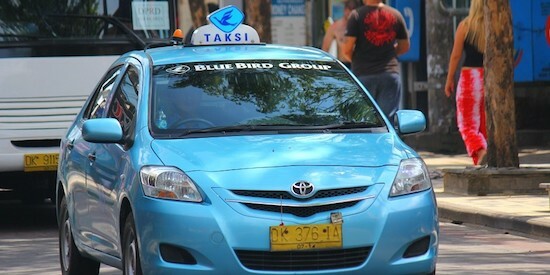 Blue Bird remains as one of the most reliable metered taxis in Bali and Indonesia in general. The Blue Bird taxi apparently still has a place on people’s hearts despite the much more affordable and more convenient online transport option. You can still spot the light-blue colored sedans every now and then on the road, and you can always try to hail them on the spot. Until now, Blue Bird is still largely the most reliable conventional taxi not just in Bali, but in many parts of Indonesia as well. If you are traveling with children, elders, or people with special needs, then you may be limited to the taxi and online car hail applications. If you can afford it though, you can hire a car with a private driver. They’re readily available anywhere in Bali. A quick google search will lead you to numerous options for a driver hire. Posting to facebook on the appropriate Bali forums on couchsurfing, facebook groups would get you offers and recommendations. Whichever option you chose on how to get around Bali be sure to do it safely and respect the local customs. Especially when you decide to rent a scooter in Bali. Wearing appropriate clothing even when you’re driving is not mandatory. But respecting the local customs as Indonesia is still a largely conservative country is just the logical and the sensible thing to do. Don’t drive while drunk. Remember that although traffic on the island can be crazy, rules at home would still apply here. How Much Can You Actually Save on Travel? How to Meet Local People During Your Travels? Buddiespeoria is dedicated to bringing you regular updates on a wide variation of travel-related topics. Whether it’s food, accommodation, transportation, travel hacks; we have them covered. Delivering the nitty gritty insights to help ease your travel is why we’re here. We don’t intend to be the know-it-all when it comes to travel, but regardless, Buddiespeoria’s greatest accomplishment is when we’re able to help readers’ travel experience with practical suggestions and insights.